Come and relax at Oft's. Awarded the 'Hidden Treasure Award' by the Nebraska Heritage Program. 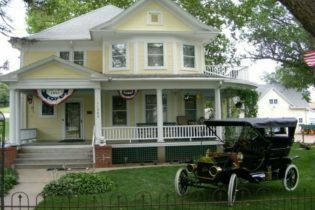 Oft’s Bed and Breakfast is operated by Gordon and Linda Mueller and is located in the small town of Bennington. Our community is very close to Omaha but we’re still surrounded by corn and soybean fields and farms. Gordon is the great grandson of Eggert and Rose Oft who built this home in 1910. The Oft-Gordon House is listed on the National Register of Historic Places and is filled with family heirlooms, art and history. This classic Queen Ann home was restored to period eloquence and integrated with modern conveniences. The home has a museum room, small library, many historical displays and formal parlor. We offer tours of the home and a self guided historic tour of Bennington’s old business district. The grounds include an upstairs balcony, wrap-around porch, fish pond and flower gardens that are shaded by a Nebraska Champion (largest) Pineoak tree. A 6 mile walking path is located across the street. We are located 15 miles from downtown Omaha, the Henry Doorley Zoo, and only 5 miles from shopping, movies and dining. We are located 15 miles from Interstates 29 and 80.